Mona Schieren: bauhaus imaginista examines the interrelations between the Bauhaus and different cultural contexts. It asks how stimuli from different cultural spheres were adopted by the Bauhaus and how its hybrid ideas evolved elsewhere, for example in China or Japan, and how they changed based on the local situation. What will be on view at the Berlin exhibition? Marion von Osten: One hundred years after its founding, we can tell a global history of the Bauhaus from different perspectives. Even in 1919, internationalism and cosmopolitanism were concepts that sought to reach beyond the national framework. Students and teachers of the Bauhaus explicitly referred to it, because modernism itself was an international and even an internationalist movement. Of course, globalization theories as we know them today were not yet relevant. So we have an advantage: For studying and telling the history of the Bauhaus’s interweaving with other modernisms means negotiating the “surplus” that has arisen from international relations, translations and migration. The focus of bauhaus imaginista is therefore not on the influence of the Bauhaus, but rather on what emerged as globalism, as “surplus” of its worldly contacts, relations and correspondences. Against this background, Grant Watson and I developed four exhibitions in 2018, which were created on-site in Hangzhou, Kyoto, Moscow, São Paulo, Lagos, New Delhi and Ahmedabad, each in a process of dialog. At the same time, events were held in Rabat, New York, Tokyo and Lagos. For the research, we worked with a network of scholars and curators with whom we jointly developed issues that had local relevance. It was not a traveling exhibition. At Haus der Kulturen der Welt, these exhibitions will once again be presented in an adapted version: Learning From deals with the artistic research of non-European cultural production; Moving Away asks how Bauhaus design concepts responded to local cultural and sociopolitical conditions in the course of migration movements of people and concepts; and Corresponding With discusses the educational practice of art schools that were active simultaneously in Asia and at the Bauhaus. And we took a site-specific method for the fourth chapter at HKW. In Berlin, with Still Undead, the Bauhaus lives on. The geographic focus here is on West Germany, the United States and Great Britain, as well as those practices of the Bauhaus that arose outside of curricula. Mona Schieren: What will be the thematic focus of the Berlin chapter, and what is the local starting point? Grant Watson: In other settings for bauhaus imaginista, we identified a particular history which became the spark to undertake research. The situation is quite different in Berlin. One local condition in Berlin is a saturated and nationalized knowledge of the Bauhaus and what it was. Right now it is the subject of a centenary celebration, meaning that our project exists in a crowded field. Hence, the condition that we began with was the need to depart from a canonical presentation of the school, to address the Bauhaus through its transnational relations into a diverse set of geographies. However, Still Undead doesn’t necessarily involve a geographic shift. It investigates marginal and ephemeral Bauhaus histories within Germany and Great Britain as well the United States. But what we do in this chapter is to extend the Bauhaus link to its limit. Mona Schieren: In the four exhibition chapters you depart from four different focal objects. Which role do they play? Grant Watson: The idea was not to focus on iconic Bauhaus buildings or designed objects. So, what we have instead are these small-scale objects. They are propositional, mostly on paper, that look towards a future application or set of conditions. These include Walter Gropius’ Bauhaus Manifesto (1919), which is of course iconic, as well as propositional, in that it sets out the ideas for a curriculum and sends a call to prospective students. Marcel Breuer’s collage ein bauhaus-film. fünf jahre lang (a Bauhaus film: five years long, 1926) runs swiftly through a series of chairs to describe the speed at which design evolves into an unknown future. Paul Klee’s sketch of a North African Carpet (1927) provides the template for a later work, perhaps a future way of working with abstraction. And Kurt Schwerdtfeger’s Reflecting color-light plays (1922) is an ephemeral play of constructivist geometry in colored light. Mona Schieren: How is this concept reflected in the exhibition architecture? Grant Watson: It was a challenge deciding how to present these as focal objects for exhibition chapters in a way that isn’t exaggerated. In most instances, rather than emphasize the objects we camouflage them within the exhibition. Gropius’ Manifesto is on the wall along with other framed works and also on a reading table, where it can be compared with texts from India and Japan on early 20th-century pedagogy. Paul Klee’s drawing is displayed within the context of research material relating to his trip to Tunisia in 1914 and also shown on a tabletop. And the Breuer collage can only be seen within the pages of the bauhaus Journal, issue 1. The exception is Schwerdtfeger’s piece, which commands a significant presence in the gallery. Mona Schieren: You invited several artists to correspond to the historical material. How do they work with those materials? Marion von Osten: In the chapter Learning From, which deals with Paul Klee’s 1927 drawing Carpet and addresses appropriation, the study of non-European cultural production and artifacts, Kader Attia’s work begins at an important interface: the problem that today leads us to examine appropriation processes such as restitution and erasure of the authorship of other cultural actors. The work is actually a commentary on what, at the center of the exhibition, visitors can see as the appropriation of and preference for Amerindian handicrafts among Bauhaus migrants in the United States. Mona Schieren: How do the artistic commissions raise relevant questions for today? Grant Watson: This question is difficult to navigate, given that no historical period can be used as the template for another and because the four chapters address different themes and concepts. But one important initiative in this respect was collaborating with contemporary artists, who in their work reflect on historical material and situate this in relation to contemporary debates. For example, Wendelien van Oldenborgh’s projects often bring together elements such as an archive and a community. And in this instance, part of what she looks at in Still Undead is the work of the Bauhaus-trained architect Lotte Stam-Beese and her buildings in the Ukraine and in the Pendrecht disctrict of Rotterdam. The latter is a postwar urban development designed by Stam-Beeze, now designated a “problem neighborhood” in which the architecture is blamed. The question posed by these projects might be: How did Stam-Beeze utilize Hannes Meyer’s ideas about “designing life” where you make the human subject and his/her environment the object of analysis? And how does this analysis relate to contemporary subjects, particularly in terms of a migrant population, who now predominantly inhabits those spaces? Mona Schieren: We’ve talked about various artistic commissions. At the same time, the exhibition also shows historical source materials and artworks. Film, audio, sound, and light will play a big role. Marion von Osten: Kurt Schwerdtfeger’s Reflecting color- light plays is the fourth focal object of the exhibition. It’s almost my favorite piece because it opens up an infinite number of threads. 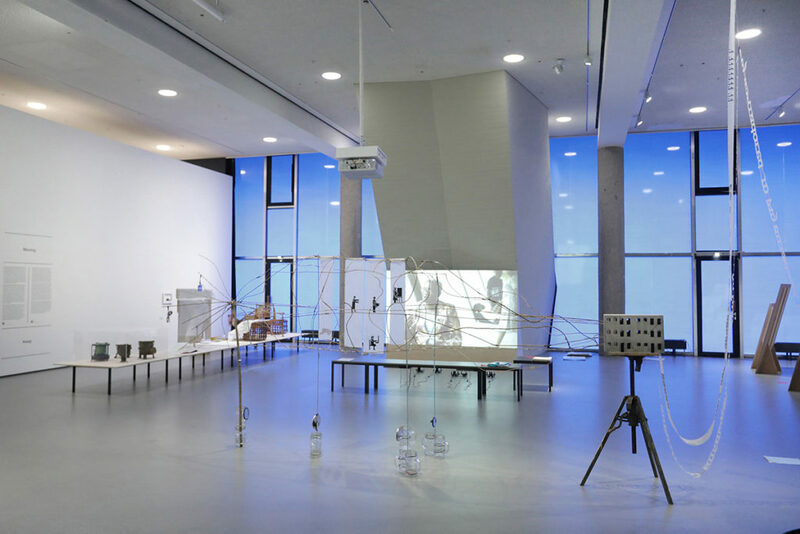 The thread of the performative light object leads to expanded cinema, which extends the cinematic apparatus towards space, performance and installation. It is a play of light and shadow in which performers project lights onto a screen and produce sound. It is a forward-facing object that was, however, created outside of the class – for a party. It is this extracurricular “surplus” that particularly interests us in Still Undead: explicitly not part of the curriculum of the Bauhaus, but introduced by students. This experimental approach is still effective in contemporary art. Mona Schieren: László Moholy-Nagy opened the New Bauhaus in Chicago in 1937 with the aim of training artist-engineers and a new type of designer. The New Bauhaus had similar goals to the Bauhaus schools of the Weimar Republic, but survived primarily as a design school. During the Second World War, it was involved in harnessing the findings of the visual arts for military use, for example in camouflage. How do you illustrate these entanglements? Marion von Osten: We constantly encountered the effects of the Second World War and the Cold War ideology in bauhaus imaginista: in the form of geopolitical shifts, illegitimate seizure of power, ideological trench warfare, but also with and in liberation movements. The military-industrial complex can be found in a camouflage workshop at the New Bauhaus in Chicago. And studies on light, photography and film are used commercially by the Eastman Kodak Company and others to this day. This tendency continues when György Kepes’ experiments with art and new communication media at MIT’s Center for Advanced Visual Studies (CAVS). So, we could say that experimental methods are taken up in new capitalist exploitation industries. But it’s not that simple, because there were also students of the New Bauhaus like Roland Nameth who filmed Andy Warhol’s 1965 Exploding Plastic Inevitable. The experimental media practice at the Bauhaus also lived on in the counterculture. Mona Schieren: Besides the New Bauhaus and the MIT, Leeds School of Art was another important venue for the artistic experiments you are discussing in the exhibition. Grant Watson: The Leeds story demonstrates the Bauhaus’s impact on one of Britain’s foremost experimental art schools, despite the fact that there were no figures such as Gropius, Albers or Moholy-Nagy. But what you do have in the late 1950s and early 1960s is the introduction of something called “basic design,” which was predicated largely on the Bauhaus preliminary course and which still exists in a different form today as the Art and Design Foundation Course at Leeds. Basic Design was developed by artists including Harry Thubron (who taught at Leeds) as well as Richard Hamilton and Rita Donagh, practitioners who introduced abstract teaching exercises similar to those used by Albers. Another factor was the development of something called Polytechnics in the late 1960s that were intended to democratize British education. In fierce debates about incorporating the “fine arts” into the polytechnic system, the Bauhaus was invoked as a prototype for how art benefits from immersion within interdisciplinary and technical environments, and the polytechnic was even described as a realization of Gropius’ vision on a grand scale. So, Leeds, benefiting from both these currents, went on to become an experimental space where both the parameters of art as well as the curriculum would be expanded and transgressed. Mona Schieren: In what way was Leeds an arena for counter-culture and queer performativity? Grant Watson: I think Leeds was interesting in the sense of its radical break with traditional art education. Leeds had sound facilities and a performance space, and while it was described as one of the most important schools in Europe since the Bauhaus, perhaps its most significant legacy in the public eye were bands such as Soft Cell and Fad Gadget, but also the Mekons, Gang of Four and Scritti Politti. Mona Schieren: And in the Bauhaus in Germany? Grant Watson: An aspect of Bauhaus parties and an idea mooted by T’ai Smith was of these events as a space for queering the school, so that they became one of the contexts in which gender roles could be explored and questioned, through dressing up, louche theatricals and so forth. Likewise, in the exhibition, we have works by Gertrud Arndt. Photography was the second largest field of study for women at the Bauhaus after weaving. And Arndt used photography to play with normative representations of femininity. Then there is the photograph that Marcel Breuer gave as a birthday gift to Gropius, with the former in drag holding a magnolia. I love this undercutting of machismo and the critiquing of the patriarchal militaristic culture from which the Bauhaus wished to break free. And then later in the 1940s, and also shown in the exhibition, are the slides by Josef Albers of attendees at a Black Mountain College party, in which the subjects appear dressed as drag kings and queens. And if you want to bring these transgressions back to British youth and club culture of the late 1980s, what you had at the time was the popular appropriation of a diffused notion of Weimar decadence: androgyny, cross-dressing and cabaret that wasn’t necessarily historically grounded in the Bauhaus, as it equally drew on Christopher Isherwood and even figures from pop such as David Bowie. Mona Schieren: One central question that runs through all the chapters and that the Bauhaus has always implicated since its foundation is the question of another, alternative knowledge. How is this reflected at HKW and in the other exhibitions? Marion von Osten: The question is: What kind of knowledge? What Gropius and others in the Bauhaus criticized was specialism. For them, it was about cooperation, it was about working together and learning from each other and from material experimentation; and thus, also against hierarchization of manual and cognitive knowledge. That’s extremely relevant. Because today we are governed primarily by cognitive knowledge. All school certificates from high school diplomas to master’s degrees are related to the recognition of cognitive knowledge. We still have a rather one-dimensional idea of what knowledge is. What we can learn from the Bauhaus is that it may be necessary to question the status quo of knowledge production, and the relation between design and art. This also means developing a new vision of education in which manual knowledge would be central too. Today, this would affect the design of our material environment for a multitude of needs including the care economy, post-national and interspecies relations, among many other things. Mona Schieren: Can you extend a bit more on the connection of Bauhaus and care economy? Grant Watson: The economy of care is interesting because, if you think about the Bauhaus, the economic model was one of factory production, even though it didn’t always necessarily achieve this. Many objects produced in the workshops remained high-end one-off products for an affluent market. Feminism redefined the notion of work, as well as the extent to which something could be understood as political. So, the arena of work comes to also mean childbirth, child rearing, domestic labor, for example. And an economy of care would extend this to include education, conservation, housing… In terms of the ecological crisis we need to shift to a new education that prepares individuals for the shift. So, maybe it’s not to think of how we bring the Bauhaus model to bear on our present, but how we imagine new forms of education that prepare for a completely different notion of economy. bauhaus imaginista is a cooperation with the Bauhaus Cooperation Berlin Dessau Weimar, the Goethe Institut and numerous partners worldwide. Since March 2018, and within the framework of the anniversary 100 Years of Bauhaus, the project, in the form of exhibitions, symposia, archive surveys, and accompanying publications, has been held in Hangzhou, New York, Kyoto and Tokyo, Moscow, Sao Paulo, Lagos, and Delhi. It can now be seen at the HKW within the framework of 100 years of Now with the bauhaus imaginista exhibition (15/3-10/6/2019), two conferences (16/3 + 11-12/5/2019), guided tours, a free audio guide and a publication covering the entire project. The Berlin program presents the fourth exhibition chapter, Still Undead, for the first time. With works from Anni Albers, Gertrud Arndt, Kader Attia, Lena Bergner, Nandalal Bose, Ahmed Cherkaoui, Alice Creischer, Zvi Efrat, Luca Frei, Walter Gropius, Doreen Mende, Hannes Meyer, Takehiko Mizutani, László Moholy-Nags, Wendelien van Oldenborgh, Hélio Oiticica, The Otolith Group, Lygia Pape, Paulo Tavares, Iwao Yamawaki and many more.